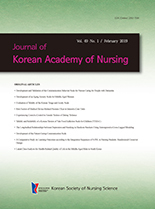 노소영, 김계하,(2013).아로마 마사지가 요양병원 입원노인의 가려움증, 피부 pH, 피부 수분보유도 및 수면상태에 미치는 효과.대한간호과학회지,43(6),726-735. Purpose: The purpose of this study was to examine the effects of aroma massage on pruritus, skin pH, skin hydration and sleep in elders in long-term care hospitals. Methods: The participants were elders over 65 years old admitted to long-term care. They were assigned to the experimental group (26) or control group (28). Data were collected from May to August, 2012. Visual Analogue Scale and Verran and Snyder-Halpern Sleep scale were used to identify levels of pruritus and sleep. A skin-pH meter and moisture checker were used to measure skin pH and skin hydration. Aroma massage was performed three times a week for 4 weeks for elders in the experimental group. The data were analyzed using the SPSS Win 17.0 program. Results: There were significant differences in pruritus, skin pH and skin hydration between the two groups. However there was no significant difference in sleep. Conclusion: The results indicate that aroma massage is effective in reducing pruritus, skin pH and increasing skin hydration in elders. Therefore, this intervention can be utilized in clinical practice as an effective nursing intervention to reduce pruritus in elders in long-term care hospitals.